The word ISLE has always been so magical to me. As a child the thought of this mysterious word with a silent “s” always brought me to daydreams of a small, beautiful and secluded paradise. Somewhere I could escape, void of chaos and confusion. I soon learned that creating things, beautiful things, could take me to this place and unlike any physical island I could keep it with me. 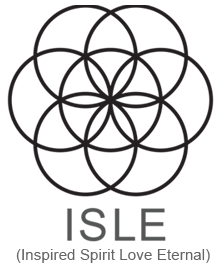 ISLE is an acronym and a play on words as symbols and what they represent. Personally, it means Inspired Spirit Love Eternal however each of these letters also represent other words that resonate deeply within me and hopefully you. This is an expression of each of these ideas and what they mean to me. ISLE is a feeling, a sense of bliss, satisfaction and peace I am hoping to share with you through our creations.